Today I will wrap up this mini-series on delay of gratification. What have you learned from parts 1 and 2? Delay of gratification is the ability to forgo an immediate, but less desirable reward, in order to receive a more desirable reward later. This ability is measured in childhood using the classic paradigm developed by Walter Mischel: Kids try to wait for two treats instead of having one immediately. Finally, you learned that performance during the delay task in childhood relates to important developmental outcomes in later life, such as social competence, well-being, drug use, and SAT scores. I’d like to conclude with some evidence on what helps or hurts a child’s chances of successfully waiting during the task. Remember, how long kids wait in childhood predicts important future functioning. If we want to help kids develop or cultivate delay of gratification ability in early life we can’t just say “wait for two cookies!” We need to give them tangible strategies to work with. To identify which strategies help, researchers conducted experiments in which they modified tiny parts of the delay task and measured how these modifications impacted the amount of time children could wait. For a great review of these studies check out Mischel, Shoda, and Rodriguez (1989). In one modification of the task, researchers varied whether the treats were in view while the child waited or were covered. The researchers found that kids could wait much longer when the rewards were covered then when they were in view. So one strategy kids could use to delay gratification is to cover the treats or look away. In another modification, the experimenter left the treats in view, but directed the children to either think about the treats, or to think “fun” thoughts. What do you think the researchers found? When the children were directed to think “fun” thoughts they could wait much longer than if they were directed to think about the treats. Thinking fun thoughts distracted kids’ attention from the rewards and thus made it easier for them to wait even though the rewards were right in front of them. In a third version, the rewards were again in view, but the children were directed to either think about the arousing qualities of the treats (e.g. think of the cookies’ chocolately, delicious taste) or the abstract qualities of the treats (e.g. think of the cookies as flying saucers). Children who thought of the treats as objects were able to wait much longer than the children who thought about how delicious the treats would taste. Although the children were thinking about the treats in both versions, the two groups were focusing their attention on different features. Thinking about the arousing features made kids want to go right ahead and eat them. Thinking about the abstract features made the treats less enticing. If it’s important to get a good grade on your final, don’t study in the same room as your TV. If you want to save money for a vacation but have to walk by a great shopping center on your way to work, call your Mom or your best friend before you pass the most tempting stores. Change the way you think about temptations. 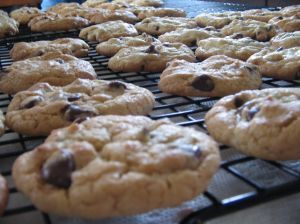 If you want to lose weight, but your coworkers are always bring treats into the office, when they pass around the tray think of their cookies as dog biscuits, or their brownies as dirt. Focus your mind on how many calories must be in each one instead of how delicious they taste. I hope you’ve enjoyed this tour-de-delay of gratification. As I said from the outset this is one of my most favorite lines of research. Over the last few weeks you’ve learned what delay of gratification is, and the outcomes it’s associated with. Today I discussed experimental research that identified strategies that help a child to wait during the task. The next step is teaching kids to use them. Hopefully future work will take up this cause. I look forward to reading about these studies (or conducting them myself)! What has helped you to delay gratification? Can you think of other strategies that researchers should evaluate?